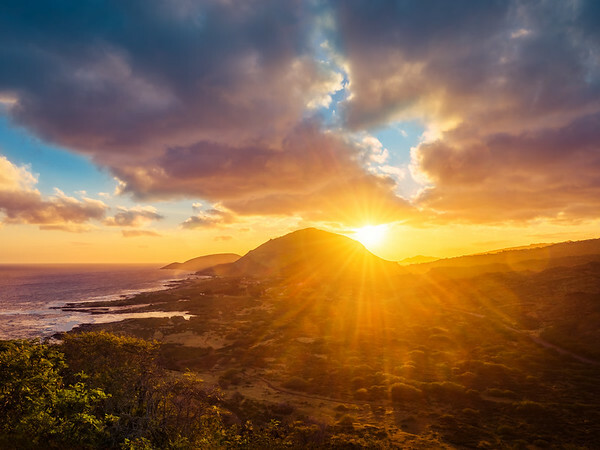 I already featured photo I took almost from the exactly the same spot while visiting Hawaii (Sunrise Over South Shore of O’ahu). The big difference though between two shots is the photo below I took at the sunset and the previously published shot was taken at sunrise. It is not often you came across the place which is perfect for both sunset and sunrise photography. Makapu’u Point Lighthouse Trail on the O’ahu island of Hawaii is one of those amazing spots. This is the extreme example of sunset photography. I was shooting directly into the sun, but it was already partly shielded by the Koko Head Mountain making the shadows of the scene very dark. The light of the scene was very dynamic. When I checked the dynamic range of the HDR image during the processing phase, the value was 19.3 stops. The human eye is considered to be the best and the most sophisticated optical device, but even a human eye can not see the entire range of the light here. This was the perfect scenario to use HDR photography and I took 3 bracketed shots with 2EV intervals (-2, 0, +2) on a tripod. I started with merging 3 bracketed shots for HDR using new Lightroom Merge tool. I have a dedicated tutorial for this technique: “Lightroom HDR – Natural Looking HDR In Lightroom”. Later I used Lightroom Rapid Editing for Landscapes (read my tutorial here), applying End of Summer preset from Landscape Collection and adjusting the exposure (image was underexposed) with the ToolKit. Also, with the help of the Topaz Star Effects plugin, I emphasized the starburst effect of the sun and to add the sun flare (see Before & After transformation below). Lightroom: import, tagging, cropping, HDR Merge, preset based processing (End of Summer preset from Landscape Collection). Topaz Star Effects was used to enhance a starburst effect and to add a sun flare.